We use PayPal to process your secure credit card transaction. VISA, MASTERCARD, AMERICAN EXPRESS or DISCOVERY card. click here to print a convenient order form. 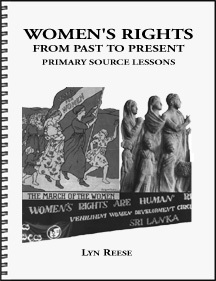 Womens Rights from Past to Present engages students in critical analysis of primary sources to explore ways societal attitudes about gender difference shaped the rights accorded to women. The unit draws attention to the times the denial of womens rights was challenged, and how the definition of rights has been expanded to be more closely aligned to issues important to the lives of most women. The excerpted sources are global in scope, selected to represent a wide range of viewpoints, cultures, and eras. Each source has a brief introduction placing it in its historical context. Discussion questions and/or activities and research suggestions follow the readings. The unit also contains a unit overview, teaching outcomes, correlations to National History Standards and AP World History topics, a glossary, bibliography, relevant internet sites, and ways to use the sources in comparison activities. To insure secure credit card processing PayPal requires that your web browser support 128-bit encryption. If nothing appears but the PayPal banner after you click one of the buttons, then you will need to upgrade your browser. For more information, click here.